Philip Venables' opera 4.48 Psychosis, a co-commission between the Guildhall School of Music & Drama and The Royal Opera, was announced as the winner of the Achievement in Opera award at the 2016 UK Theatre Awards. The opera, based on the final work by the playwright Sarah Kane, represented the culmination of Venables' period as Doctoral Composer-in-Residence at the Guildhall School and The Royal Opera. 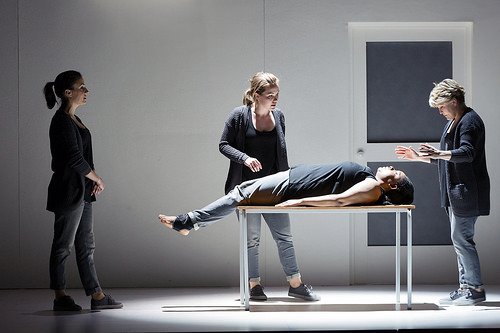 4.48 Psychosis was premiered by The Royal Opera at the Lyric Hammersmith in May 2016, with sopranos Gweneth-Ann Rand, Jennifer Davis and Susanna Hurrell, mezzo-sopranos Clare Presland, Lucy Schaufer, and Emily Edmonds, and chamber ensemble CHROMA, conducted by Richard Baker, Professor of Composition at the Guildhall School. The production was directed by Ted Huffman, who made his Royal Opera debut, and designed Hannah Clark, who also made her Royal Opera debut, and lighting designer D.M. Wood. Venables was the first Doctoral Composer-in-Residence; this is a Composer-in-Residence studentship which leads to a doctoral research degree. Fully funded by the Guildhall School and supported by The Royal Oper, the studentship offers one composer every two years the opportunity to be Doctoral Composer-in-Residence over a three-year period, during which time the composers researches and writes a major work, which is staged by The Royal Opera. The position is supervised by Head of Composition at the Guildhall School Julian Philips and Associate Director of Opera at The Royal Opera John Fulljames. This collaboration between the Guildhall School and The Royal Opera which was launched in 2013 and is one of the first examples of a conservatoire and an opera company joining forces. In September 2015 Na’ama Zisser joined the programme as the second Doctoral Composer-in-Residence. Her new opera is due to be staged by The Royal Opera in 2018.